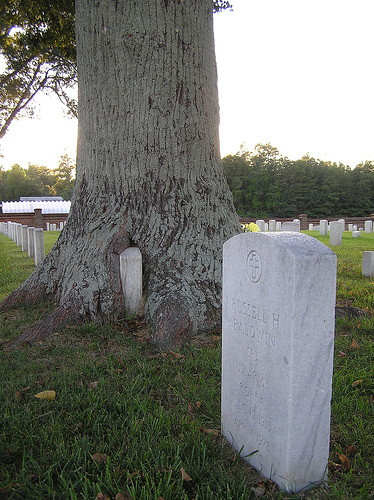 The Cold Harbor National Cemetery was established in 1866 and is located on the site of the Battle of Cold Harbor and seven miles east of Mechanicsville. It was an historic clash between General Robert E. Lee and General Ulysses S. Grant. 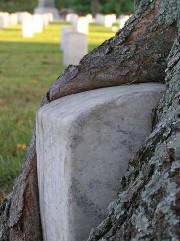 It is one of six Civil War-era cemeteries maintained by the Department of Veterans Affairs in the Richmond, Va., area. All these national cemeteries are historically linked to the Union assault on the southern capital of Richmond: Seven Pines, Richmond, Glendale, City Point and Fort Harrison. Cold Harbor near Mechanicsville, VA. The 1.4-acre Cold Harbor Cemetery is preserved in a relatively rural context, partly due to neighboring lands that are part of the discontiguous Richmond National Battlefield Park, which is managed by the National Park Service. Across the road is the Garthright house, which served as a Union field hospital from June 3-12, 1864. The Battle of Cold Harbor (or Gaines Hill) occurred in June 1864, although cemetery burials were collected here from a 22-mile area. The layout is typical for small, older cemeteries, that of a nearly perfect square with two 10'-wide bisecting paths and a central flagpole. Before, the permanent masonry structures were constructed, the keeper resided in a white "wooden cottage" surrounded by a white picket fence and Osage orange hedge that kept animals from disturbing the graves. Now, the cemetery features a standard masonry Second Empire lodge designed by Quartermaster General Montgomery C. Meigs and a paneled brick enclosure wall. These were both constructed in 1871; by this date, just over $18,000 had been spent on the cemetery. In the early 20th century, service structures including tool, well and oil houses were built and rebuilt. Civil Works Administration laborers did much of this construction during the 1930s. During the late 19th century, Cold Harbor was designated a third-class cemetery, a rating based on size and activity (by comparison, Richmond National Cemetery was rated first-class). Acquisition of the land by the U.S. government was formally completed in 1870 for $200, but the next year additional border acreage was purchased for about $300. One of the first superintendents at the cemetery, Augustus Barry, is the only Medal of Honor recipient buried here. 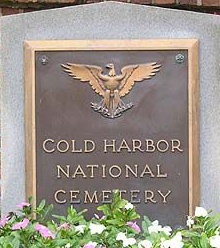 Cold Harbor National Cemetery was listed on the National Register of Historic Places in 1995. 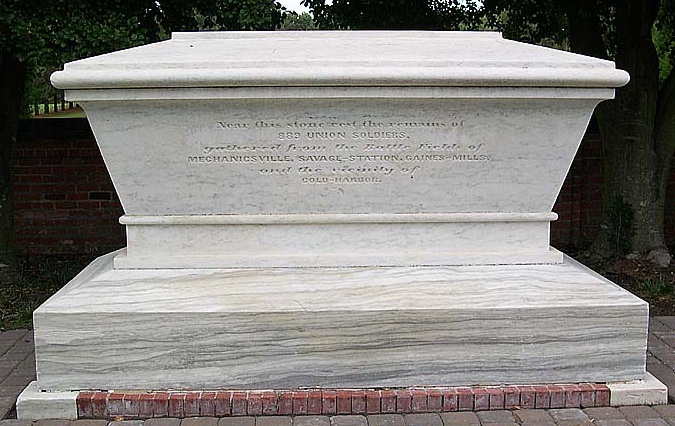 (Above) The Tomb of the Unknown Soldier, built in 1877, is a 5-foot high marble sarcophagus erected by the U.S. government at a cost of $2,151. It commemorates 889 unknown Union dead who were buried in nearby trench graves located on the battlefields of Mechanicsville, Savage-Station, and Gaines Mills. Cold Harbor Cemetery was established and opened in 1866, just two years after the armies fought on this very ground. 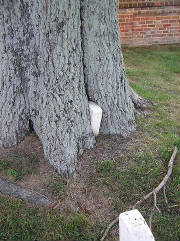 These trees, as seen to the right, are now growing to a size where they're absorbing the surrounding tomb stones. (Left) Planted more than one hundred years ago, this tree has devoured the tombstone at Cold Harbor Battlefield. The Pennsylvania Monument, built in 1909, was erected by the Commonwealth of Pennsylvania to commemorate the losses of its regiments that fought at Cold Harbor in 1864. The dedication ceremony, 45 years later, lasted six days and was attended by 690 of 937 surviving veterans of these troops and commonwealth officials. A memorial commission was established in 1907, which set a limit of $5,000 for the cost to build the memorial. Architect J. Henry Brown of Richmond designed the more than 30-foot tall granite shaft topped by a soldier standing at parade rest. The 8th New York Heavy Artillery Monument was erected in 1909 by the state of New York to honor the 219 members of this regiment who died as a result of the Battle of Cold Harbor. The granite block features a bronze tablet on which the names of the dead are listed. 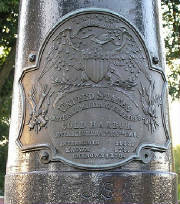 One inverted cannon was installed by 1871 bearing a bronze plaque that identifies the location of the cemetery and number of dead interred there. Sergeant Major Augustus Barry, (Civil War), 16th U.S. Infantry. Place and date unknown, 1863-65 (Section A, Grave 309). By contrast, he depicts Lee as a commander beset by poor health and impossible logistical problems who brilliantly deployed his meager forces and soundly thrashed his overconfident adversary, thereby saving the rebel capital and extending an unwinnable war by nearly a year. The book is rich in word pictures and engaging anecdotes. Furgurson considers the wounded that were left to suffer with the dead between the lines while Lee and Grant quibble over protocols of recovery; the disastrous affect of poor maps and impassable terrain on the Federal assault; and Grant's immediate need to bring Lincoln a battlefield victory before the 1864 presidential election. Furgurson's contribution is his evocative retelling of a great American military tragedy. Common soldiers struggle to find the words to describe the agony of their comrades, incredible tales of individual valor, their own mortality. Also recounting their experiences are the women who nursed these soldiers and black troops who were getting their first taste of battle. The raw vitality of battle sketches by Edwin Forbes and Alfred R. Waud complement the words of the participants. PRAISE FOR THE BOOK: "Bloody Roads South is a powerful and eloquent narrative of the costliest, most violent campaign of the Civil War. Grant vs. Lee in the Wilderness, at Spotsylvania, and at Cold Harbor has never been told better. "-Stephen W. Sears, author of The Landscape Turned Red. About the Author: Noah Andre Trudeau is an executive producer for cultural programs at National Public Radio in Washington, D.C. He is the author of Out of the Storm: The End of the Civil War, April-June 1865 and The Last Citadel: Petersburg, Virginia, June 1864-April 1865.